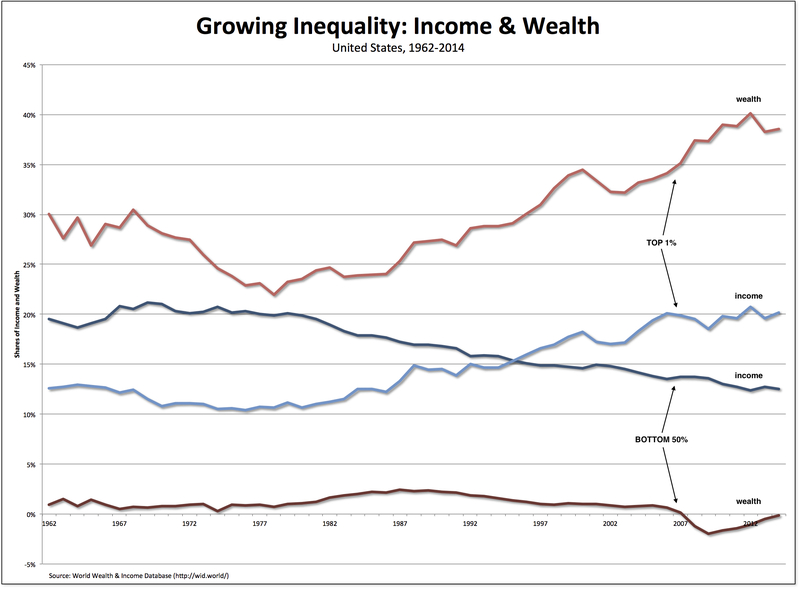 Frank de Libero makes a reasonable argument: that (at least for the United States) the Gini index is redundant and can be replaced as a measure of inequality by the household income share of the top quintile. 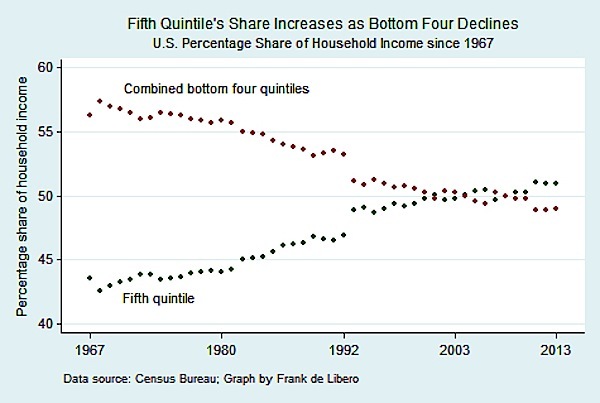 The above chart shows, since the late-1960s, the share of income to the top quintile growing while the combined share of the bottom four quintiles falling. Thus, for example, the fifth quintile averaged over the last few years captured 51 percent of total income compared to a 43 percent average income share in the beginning of the timeline. The combined income of the rest of the households has moved in exactly the opposite direction. I often explain to students that Gini coefficients should be used with more than a few grains of salt. One reason, as Timothy Taylor explains, is that changes in the Gini coefficient don’t tell us where the changes come from. because the Gini boils down the overall distribution of income to a single number, it also loses some detail. For example, if the Gini coefficient has risen, is this because the share going to the top 20% went up, or the top 10%, top 1%, or top 0.1%? You can see these kinds of differences on a Lorenz curve, if you know what you’re looking for, but the Gini alone doesn’t tell you which is true. 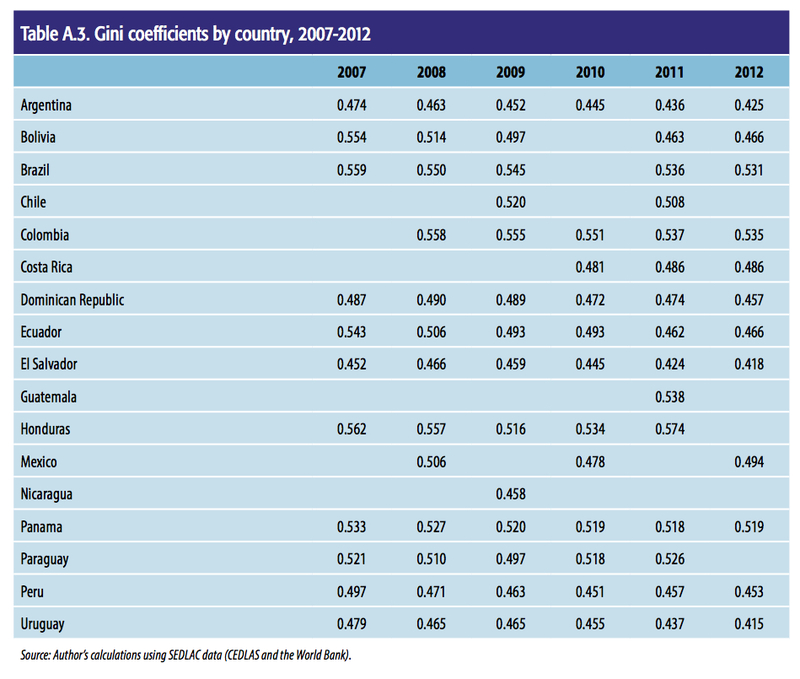 The other reason, which Taylor does not discuss, is that Gini coefficients should not be compared across countries. That’s because it’s blind to different economic and social structures. Thus, a coefficient of .52 in one country, where all goods and services are private commodities, means something quite different from the same number in a country in which many of those commodities (such as education, healthcare, and so on) are provided as public goods. So, what is the Gini coefficient good for? There are two acceptable uses for that simple, convenient number. 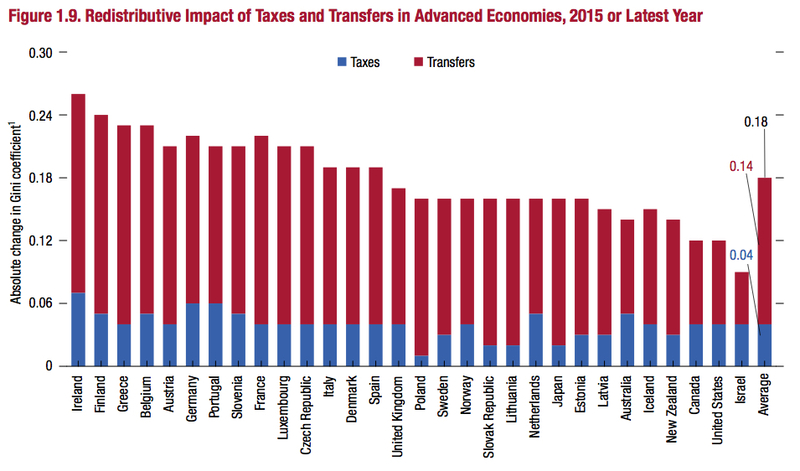 One is to look at the degree of inequality before and after fiscal policy, as in the chart above (from the World Bank [pdf]. There, we can see that fiscal policy in Latin American countries does very little to alter the before-fiscal-policy, or market, distribution of income. The other acceptable use is to look at the changes over time for the same country, as in the chart below from the same report. What we can see, once we resist the temptation to compare numbers across countries, is that there is a wide range of experiences across Latin America: while Honduras’s distribution of income became slightly more unequal (increasing by 2.1 percent between 2007 and 2011), Mexico’s became a bit more equal (falling 2.3 percent from 2008 to 2012) and Bolivia’s fell quite dramatically (by 15.9 percent from 2007 to 2012). So, yes, go ahead and look at changes in Gini coefficients for individual countries—before and after fiscal policy, and over time—but, by all means, resist the temptation to compare the coefficients across countries. Such comparisons are, at best, meaningless and often can be quite misleading.